A FORMER council leader and his wife are ‘safe and well’ after an ‘horrendous night’ on a cruise ship stranded in rough seas. Former Havant Borough Council boss Michael Cheshire and his wife Wendy were among 1,373 passengers stuck on MV Viking Sky after its power failed off the coast of Tromsø, Norway. More than 470 people were airlifted off the ship following a Mayday call sent out yesterday, with passengers facing a 15-hour wait to be rescued as the vessel was battered by ‘dreadful and dangerous conditions’. But Michael and Wendy were with the 894 guests and crew who stayed on the ship as it made its way to a port in Molde this afternoon, helped by tugboats, after it successfully restarted three of its four engines. Mr Cheshire said: ‘We have had a real tough night in raging seas and high winds. Twenty people were injured in the drama and some remain in medical care, Viking Cruises has said. Royal Navy veteran Mr Cheshire, who is a former captain of HMS Victory, was on board MV Viking Sky as its ‘resident historian’ – giving lectures on the Vikings, the Hanseatic League and the Bayeux Tapestry. 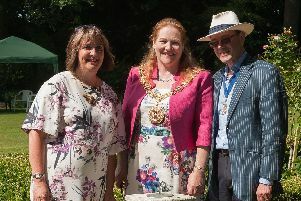 He laid down his duties at the council a year ago to pursue the interest, after taking a five-month sabbatical in 2017, as leader, to ‘enhance his knowledge of history and public speaking’. It is believed 200 Britons set sail on the MV Viking Seas when it left Norway’s second-largest city, Bergen, for a 12-day cruise on Thursday, March 14. Another couple from Hampshire, Derek and Esther Browne, were also on MV Viking Sky but were airlifted to safety. Built in 2017, Viking Sky visited Portsmouth in 2018 and The News was invited on board to look around. You can watch a video tour of the ship here. Video above, captured by US passenger Ryan Flynn, shows passengers preparing for evacuation after a door on board was blown in by a wave.